Indeed I'm not using Photoshop but PaintShop Pro. But I'd never recommend any of them to enhance minerals photos since I consider this unacceptable, even (and especially) if you're a dealer. I think they should only be used to make the pictures the closest possible to the original, not to cheat. When I wrote "enhance" I was only referring to improving the image as it represents the specimen. I would never suggest that you would "cheat" by making the specimen look better than it really is. I personally don't do the enhancement because I have not learned how to use photoshop or paintshop pro or any of the other tools available for changing the images. I have no problem with those who do. 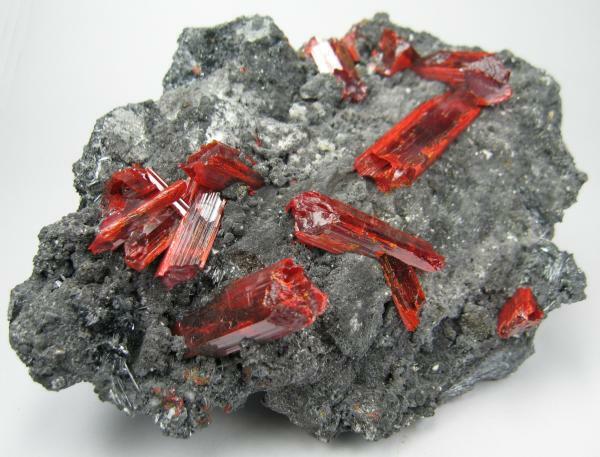 Cherry-red realgar prismatic crystals on a matrix of stibnite. Overall size: 106 mm x 71 mm. Main crystal: 9 mm wide, 24 mm long. Weight: 230 g.
I just do not like it much. Aber vielen Danke für deine lieben Worte! 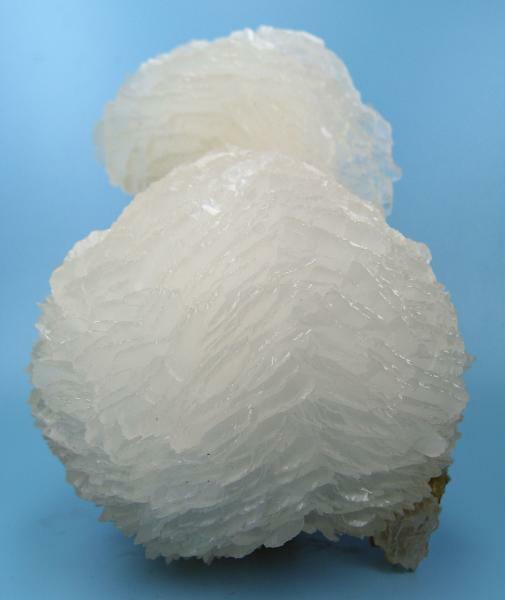 Two hemispherical crystal groupings of colorless curved rhombohedral calcite crystals. Overall size: 100 mm x 65 mm x 44 mm. Main crystal size: 63 mm in diameter. Collected June 2001. Ex Minette collection. Turt Mine, Satu Mare, Maramures Co., Romania. I personally don't do the enhancement because I have not learned how to use photoshop or paintshop pro or any of the other tools available for changing the images. Learning how to use an enhancing photo tool is much easier than you think. In fact, it's a matter of 5 minutes to begin getting the first results. If you ever need some help I can offer you a little of mine, privately (provided you use the same program as I do, the license of which costs less than $70). 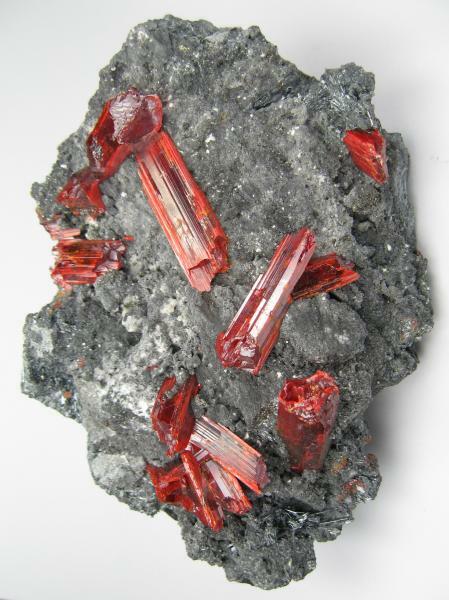 Group of tabular Baryte crystals up to 45 mm, with numerous acicular crystals of stibnite to 26 mm in length replaced by brown stibiconite scattered about the Baryte crystals, on a matrix plate of crystallized iron stained drusy quartz. Overall size: 113 mm x 93 mm x 38 mm. Dahegou Mine, Lushi Co., Sanmenxia Prefecture, Henan, China. That's an amazing piece Carles. Many thanks once again for your kind comment. 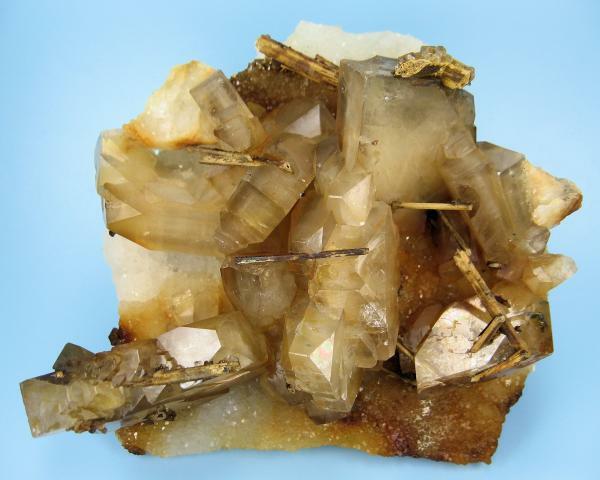 The cervantite I mean stibiconite with Baryte really speaks to me. The contrast of the earthy stibiconite with the splendent Baryte, set against the background of the iron-stained quartz, well, it all just comes together perfectly. No, my Baryte with stibiconite is just an isolated specimen I purchased two years ago. As you may have seen, GneissWare has posted another one that must be from the same mine. I'm sure your Baryte-stibiconite comes from the same locality as mine. But I don't know which is the right one. 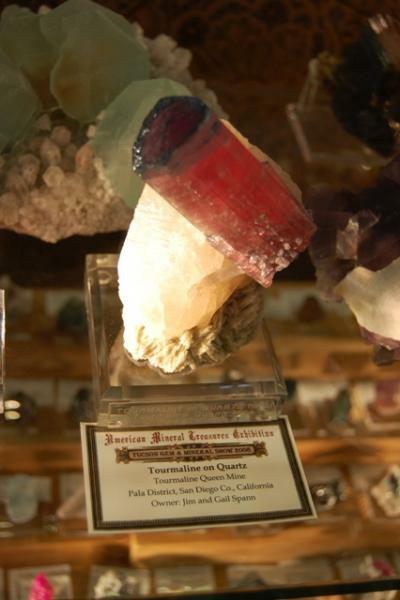 Perhaps some Chinese minerals connoisseur out there can help. 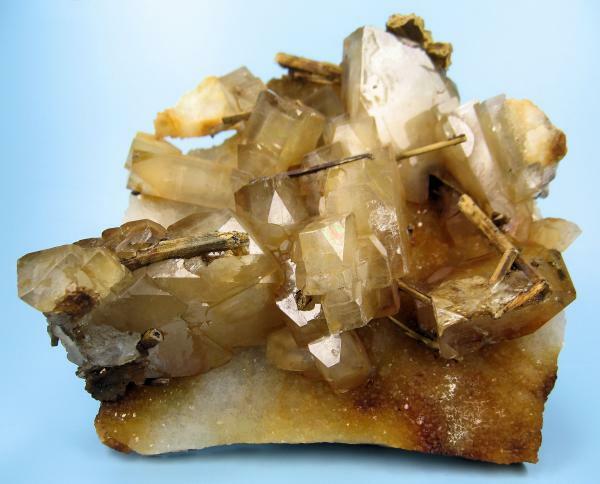 Try googling "Xikuangshan stibiconite Baryte". You may find a few things of interest. 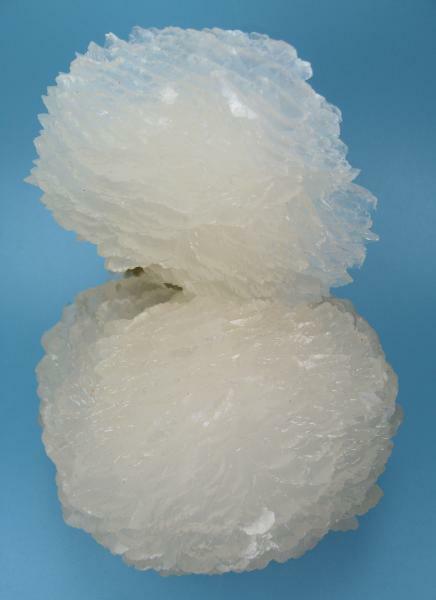 And try googling "Lushi stibiconite Baryte". You may find a few things of interest too. We need a Chinese minerals expert!! I'll be meeting with several Chinese experts on Thursday for dinner, and I'll ask their opinions on both pieces. I checked Mindat, and both are pieces are pictured, each with their respective localities, so that is no help. I'll post whatever I find out, but even then, it may not clarify anything. ...We need a Chinese minerals expert!! 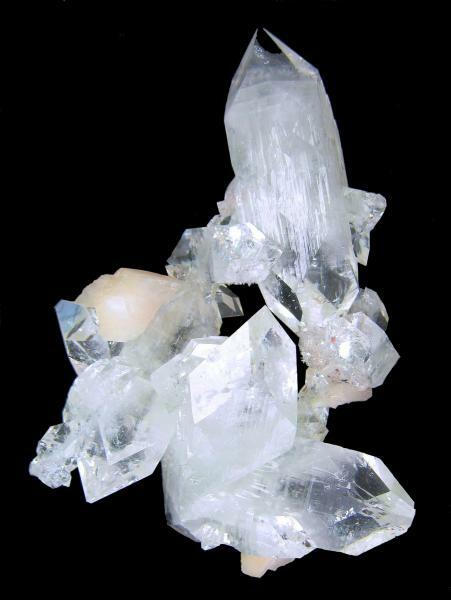 Cluster of colorless transparent prismatic apophyllite crystals, many doubly terminated, with minor stilbite crystals in association. It's a floater, I can see no point of attachment. Undamaged. Overall size: 100 mm x 70 mm x 40 mm. 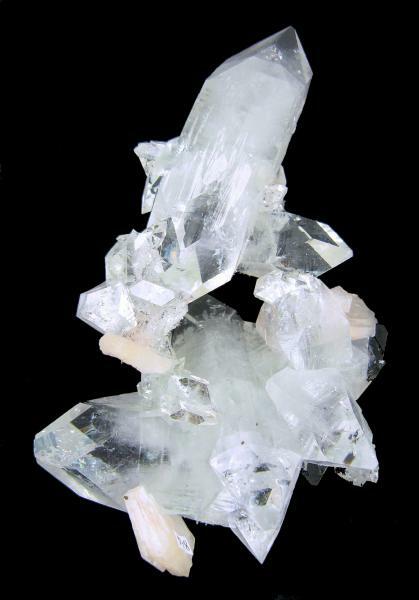 Largest apophyllite crystal size: 65 mm x 17 mm x 17 mm. 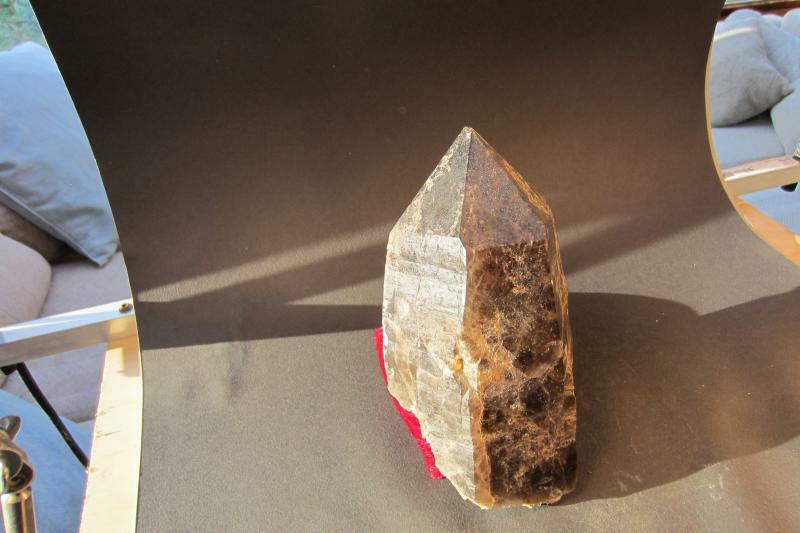 Weight: 122 g.
The consensus on the Stibnite on Baryte specimen from the Chinese experts is that both are from the Xikuangshan Antimony Mine.